President Recep Tayyip Erdoğan (C), Iran’s President Hassan Rouhani (L) and Russia’s President Vladimir Putin (R) shake hands after a joint conference as part of a tripartite summit on Syria in Ankara, April 4. 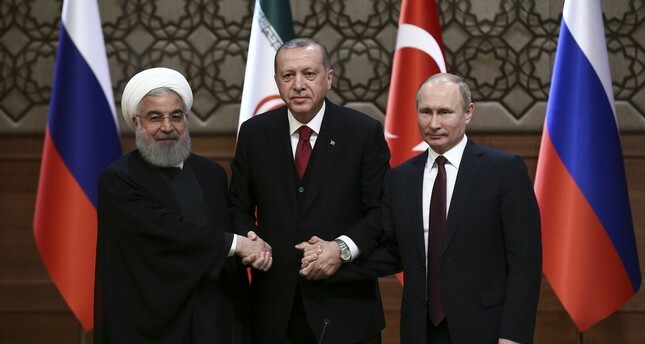 President Recep Tayyip Erdoğan is scheduled to meet Russian President Vladimir Putin and Iranian President Hassan Rouhani on Friday for the third round of the tripartite summit in Iran's capital Tehran. In addition to the ongoing seven-and-half-year Syrian war, particularly the escalating crisis in the northwestern city Idlib, the trilateral summit will focus on developing regional economic cooperation and ways to maintain trade flow in the face of unilateral sanctions re-imposed by the U.S.
Having previously met in the Russian resort town Sochi in November 2017 and Turkey's capital Ankara in April 2018, the meeting of Turkish, Russian and Iranian leaders in Tehran comes at a time when the Syrian regime is planning attacks on Idlib, which is home to around 3.5 million civilians who fled from the atrocities of the war from different cities across the country. Various sources originally reported the summit would be held in the northern Iranian city of Tabriz. But Kremlin spokesman Dmitry Peskov said on Aug. 31 "the Iranian side went back to the option of Tehran," according to AFP. While the Iranian and Russian governments support the regime's plan to chase "extremist groups" deemed terrorists out of Idlib, Turkey is carrying out negotiations in order to stop an Aleppo-like crisis, which could result in a major immigration flock, civilian casualties and fatalities. Against this backdrop, the three leaders will work on a plan to safeguard Idlib, the last opposition stronghold in Syria to avoid any disasters while clearing the city of terror groups which Turkey claims should be identified in close cooperation and intelligence sharing, as Foreign Minister Mevlüt Çavuşoğlu said on Friday. "Besides the tripartite summit between leaders and bilateral meetings as well as a discussion for a road map on Syria, Erdoğan, Rouhani and Putin will exchange views and elaborate on other issues including economic relations and a plan against U.S.-imposed sanctions as all countries have been exposed to these sanctions," Dr. Gholamreza Mesbahi-Moghadam, vice president of Imam Jafar Sadıq University, a former member of seventh, eighth and ninth legislatures of the Islamic Republic of Iran, and the member of the Expediency Discernment Council, told Daily Sabah in an exclusive interview. The agenda of the bilateral meeting between Erdoğan and Rouhani during the Tehran summit will be particularly preoccupied with economic cooperation between the two countries. Referring to President Erdoğan's October visit when the two leaders expressed common determination to increase bilateral trade to $30 billion, which currently hovers around $10 billion, and the use of national currencies in the commercial transactions, Moghadam stressed that Turkey and Iran are expected to take more concrete steps regarding the use of national currencies in bilateral trade. The leaders' summit, however, will be held during a period of a currency crisis in all countries, which has been recently heated due to the strained ties with the U.S. imposing various sanctions on Turkey, Russia and Iran. The Turkish lira has depreciated more than 45 percent against the U.S. dollar since the beginning of this year and most of this loss has occurred in the past month that witnessed the escalation of a diplomatic crisis between Turkey and the U.S. Moreover, the Iranian rial has lost more than half of its value against the greenback and the government intervened to unify official and free-market exchange rates for the rial in favor of a single rate set at 42,000 against the U.S. dollar in April. In free market rates, one rial can still be changed at nearly 110,000 against the dollar. After the announcement of new sanctions on Russia, the country's currency ruble has also devalued by nearly 20 percent since the beginning of this year. In the face of pressures on their currencies, Turkey, Iran and Russia have started seeking ways to ditch the dollar in trade and trade in national currencies has become the hot topic of recent months. Government officials from all three countries have expressed a strong will to use their own currencies in energy trade and the commercial exchange of other goods to clout the reign of the U.S. dollar in global trade. In April, Turkey and Iran issued the first letter of credit in the form of a national currency swap to exchange the Iranian rial and Turkish lira. The swap will ease trade, transactions between the two countries and lower foreign currency risks after both currencies faced depreciations recently. Under this system, there is no need to rely on a third-party currency, like the U.S. dollar or euro. A prolific name of Islamic finance and hojjat al-Islam (authority on Islam), Moghadam drew attention to the complementary features of Turkish and Iranian economies and said, "Iran's energy resources have the capacity to galvanize the growth of the Turkish economy and Iranian businesses could and should benefit from the experience of the Turkish real sector to a great extent." In order to surmount economic, political and social crisis in the region, Moghadam said, Turkey and Iran should lead the efforts at the regional scale to ensure the full mobilization and capitalization of available resources. With a total population of 160 million, both countries have immense human resources, he pointed out, but they lack the urge to cooperate to unleash the potential to unravel economic cooperation and association in the broader region. Moghadam underscored that determined and well-planned cooperation would alleviate and eliminate the pressure on the economic and financial structures of Turkey, Iran and other countries in the region. Turkey, Iran and Pakistan established the Economic Cooperation Organization (ECO) in 1985 with a view to establishing a single market similar to the European Union for the trade of goods and services, Moghadam recalled, and added that the ECO later expanded with the participation of Central Asian countries. Currently, the organization has 10 members, including Afghanistan, Azerbaijan, Kazakhstan, Kyrgyzstan, Tajikistan, Turkmenistan and Uzbekistan. Later in 1996, with the aim of developing cooperation, the Developing 8 (D-8) Organization for Economic Cooperation - consisting of Turkey, Iran, Malaysia, Pakistan, Bangladesh, Egypt, Nigeria, and Indonesia - was founded with the leading efforts of late professor Necmettin Erbakan, then-prime minister of Turkey. Within this framework, Moghadam emphasized that the urgent necessity to make these organizations more efficient to devise a mechanism for free trade among regional countries. Another important topic in the Tehran summit will be actions to be taken against the U.S.-imposed embargo on Turkey, Iran and Russia, targeting either individuals, government officials and trade of commodities and goods, thus taking aim at their economies. "Turkey, Iran and Russia will weigh their options to work against the unilateral U.S. sanctions at the Tehran meeting, in addition to cooperation in Syria," said Asadollah Asgaroladi, the chairman of Iran-China Chamber of Commerce and Industries and the president of Hasas Co., the leading exporter of nuts and pistachios of Iran since 1953. "Iran has been under U.S. sanctions for the last 40 years. Beginning with Carter in 1979, the sanctions regime has continued with Ronald Reagan in 1984, Bill Clinton in 1996, George W. Bush in 2002 and Barack Obama in 2012 and now Donald Trump," Iranian business magnate Asgaroladi said in an exclusive interview with Daily Sabah. He emphatically stated that the U.S. and other Western powers have repetitively imposed sanctions on Iran since the revolution in 1979 and tried to punish the country by hitting its economy. Yet, he added, Iran and its people have learned how to adjust to the regime of sanctions and how to conduct business under the sanctions. "As we have done so far, we will continue cooperating with our trade partners in the upcoming period and alleviate the impacts of sanctions. Iranian politicians have delivered a good performance and skipped the sanctions," Asgaroladi pointed out. In order to maintain trade flow, the Iranian businessman said, Turkey and Iran may recourse to barter in trade, use national currencies or find other ways to compensate for the payments of the trade transactions. Asgaroladi also stressed that Turkey and Iran will soon take steps to develop a payment system that will facilitate financial transactions, which he sees as a more urgent and pressing issue. He recalled that Malaysia, Turkey and Iran have so far demonstrated limited success in the development of Islamic banking that could avoid the reign of the U.S. dollar and interest rates in investments and trade. Particularly with the sanctions regime, the issue now requires more hard work and cooperation among states with the participation of the EU since all parties have high interest in preserving trade, particularly in energy. On May 8, U.S. President Donald Trump announced that he pulled the U.S. out of the Iran nuclear deal, also known as the Joint Comprehensive Plan of Action (JCPOA), which took effect in 2015 as a result of negotiations lasting more than two years with the participation of the permanent members of the United Nations Security Council (UNSC), P5+1 including China, Russia, France, the U.K. and the U.S. plus Germany. The first round of sanctions entered into force on Aug. 6 and target Iran's second largest industry, the automotive sector, as well as the trade of precious metals and financial transactions in U.S. dollar. The second round of sanctions will begin on Nov. 4 and hinders energy trade with the world's third largest oil exporter. On Aug. 1, the U.S. administration levied sanctions on two Turkish government officials, Interior Minister Süleyman Soylu and Justice Minister Abdülhamit Gül, alleging that the ministers played role in the arrest and detention of American pastor Andrew Brunson, who is now under house arrest in Turkey's İzmir province due to his links with the Gülenist Terror Group (FETÖ) and the PKK, a U.S. and EU-designated armed terrorist organization. In retaliation, Turkey ordered freezing the assets of two U.S. officials. Moreover, on Aug. 10, U.S. President Trump also raised tariffs on imported steel and aluminum from Turkey by 50 percent and 20 percent, respectively, escalating the tension and blatantly targeting the Turkish currency and economy. Moreover, U.S. sanctions against Russia over the poisoning of a former Russian agent and his daughter in Britain took effect on Aug. 27, targeting foreign aid, the sale of defense and security goods, and U.S. government loans for exports to Russia. The U.S. Department of State argued that Russia violated the 1991 U.S. law when it used a nerve agent in an attempt to "assassinate" Sergei and Yulia Skripal. The sanctions package includes the prohibition of foreign assistance to Russia under the Foreign Assistance Act of 1961, except for "urgent humanitarian assistance." It also prohibits exports of weapons and dual-use products to Moscow. The sanctions also deny Russia "any credit, credit guarantees, or other financial assistance by any department, agency, or instrumentality of the United States government, including the Export-Import Bank of the United States." The restrictions will remain in place "for at least one year and until further notice."